The R4’s low profile and lightweight (ADULT 635 grams/YOUTH 386 grams) design provides superior range of motion without sacrificing function. The R4 Adult Neck suppport weighs 1.05 lbs. Size range is 5'3" and above. Works really well together. Can be worn in or over jersey. Neck brace fits 6 to 16 yrs, armour9 to 16 I’dsay. Subject how big you are! ATLAS NECK BRACE MOTORCROSS SIZE L/XL EXCELLENT CONDITION. Adjustable Velcro Fastening to Suit Age Fit. Washable fabric. Atlas Air Neck Brace Protection - Medium / Motocross / MX / Downhill / DH / MTB. Real nice neck brace Bought for a single trip to The Alps and didn’t wear it every day so it’s had about 12 hours use. There is some dirt/mud on it. I’ve wiped it down but don’t expect mint! Functionally perfect. Cost over £100 new, a year ago. Grab a bargain! NecksGen size Large Safety Device, not HANS / simpson hybrid etc.. Here we have a size Large NecksGen safety device (dated 2013), in used condition. It’s too big for me now therefor no longer required. Please note there is some damage to the rear strap slide, personally I do not believe it affects the operation. Clearly this is a safety device so please be happy with its condition before bidding, if you would like any more pictures please ask. If you have any question’s don’t hesitate in contacting me. EVS R3 Neck Protector. Clothing > Armour & Protection. TheEVS R3 2013 Neck Support Brace is currently available in the colours shown in the product variation above, if there is no variation option, it will be available in the colours as shown in the pictures above. 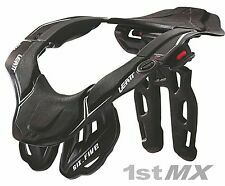 Leatt Neck Brace Kart (Fits Small / Medium - Age 4 to 16). Condition is Used. EVS R2 Neck Protector. Clothing > Armour & Protection. Show all EVS products. TheEVS R2 2013 Neck Support Brace is currently available in the colours shown in the product variation above, if there is no variation option, it will be available in the colours as shown in the pictures above. Wulfsport Neck Roll Neck Support. Wulfsport International. Check availability with our specialists. Soft interior / durable exterior. View Our Categories. Wind Guard Material. This applies to all to our products. Covers Chest. Light Weight. Stabiliser pads transfer impact stress loads away from spine. This design can help to reduce he risk of more serious factures or muscular injuries. In the event of a crash it’s designed to effectively divert impact forces away from the neck area. Schroth HANS Fixed Tethers removed from a HANS FHR device. Will likely fit other brands as well, please check fitment before bidding. No damage or issues with these, I've simply changed to sliding tethers. Fixing brackets and bolts included. On each bracket, the 2 mounting holes are 2.75cm apart. Length of each tether = 33cm (from centre of helmet mounting post to end) Any questions please ask, can be collected from central London. Material: PU, PVC. We will help you step by step for the exchang process. Installations are not included in most casess. We take no responsibility in teaching you how to install. Technical Support. Connect your cloth with zipper: Easy for connecting with your cloth and taking it out with zipper. Velcro adjustment position. Nocternal Reflex: With reflex strap to alert others at night. Relax the pressure of your spine and neck when riding for a long time. POLISPORT NECK PROTECTOR. No need to strap down to chest protectors. We will always help you to have a 100% positive happy buying experience. Jacket Zipper Relief area. Designed to be worn over the jacket or suit. Adjustable body strap system for a secure fit. Unique adjustable scapula Wing designed to accommodate an aero hump or back protector. ACERBIS NECK STABILIZING SUPPORT COLLAR. Ergonomically shaped stabilizing collar is made of hypoallergenic, soft, comfortable materials. These collars are equipped with a removable fastening systems to ensure a comfortable, yet secure fit. 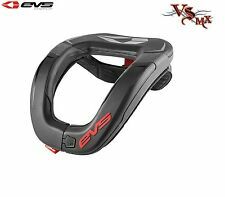 EVS R2 Neck Protector. Connection loop allows direct connection to a chest protector. Removable / Washable Covering - covering can be zipped off at the back for washing to keep the collar clean and fresh. POLISPORT NECK PROTECTOR. No need to strap down to chest protectors. NEW LEATT GPX 3.5 NECK BRACE WHITE MOTOCROSS MX ADULT L/XL. Condition is Used. Dispatched with Royal Mail 2nd Class. Never been worn on a ride but been taken out of the box. Leatt Fusion 2.0 Junior Youth Kids Motocross Neck Brace Armour Combo. Transworld Motocross Magazine says: “The Leatt Fusion Vest 2.0 Junior is the perfect answer for mini riders who want the ultimate in protection.”. Atlas Tyke Kids Neck Brace in the Ghost design - Atlas Brace Technologies Kids Neck Braces. The Atlas Tyke is our little pride and joy, purposely built to protect yours. As parents we care deeply about our children's safety, so we built a product for our little ones to enjoy as much as we do, along with giving us a little extra piece of mind. Atlas Tyke Kids Neck Brace in the Nightshift design - Atlas Brace Technologies Kids Neck Braces. The Atlas Tyke is our little pride and joy, purposely built to protect yours. As parents we care deeply about our children's safety, so we built a product for our little ones to enjoy as much as we do, along with giving us a little extra piece of mind. Atlas Tyke Kids Neck Brace in the Tundra design - Atlas Brace Technologies Kids Neck Braces. The Atlas Tyke is our little pride and joy, purposely built to protect yours. As parents we care deeply about our children's safety, so we built a product for our little ones to enjoy as much as we do, along with giving us a little extra piece of mind. 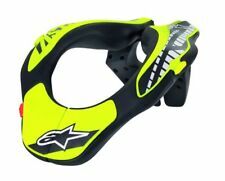 Alpinestars Kids Youth Motocross Neck Support Collar. Specially designed for youth rider. Pro Lite Carbon Neck Brace L/Xl.